With offices in Ireland and the UK, Ardoo Caresafe is an innovative manufacturer of specialist medical devices and disability aids. The company produces the Ardoo Caresafe 140 hoist, which it describes as the most compact, portable hoist available globally. Manufactured from its modern facility in Dublin, the company fully tests each hoist to ensure CE compliance and supplies each device with a guarantee. Working through a network of distributors, Ardoo says its mission is to ease the workload of the carer and enhance the comfort and quality of life for those being cared for. Ardoo Caresafe is on the lookout for distributors for its Ardoo 140 portable hoist. According to the company, the hoist ticks all the boxes with its lightweight and distinctive features. The lightest folding hoist available says Ardoo, the 140 portable hoist also includes the unique lifting boom, facilitating placement in front and rear seats of a car. 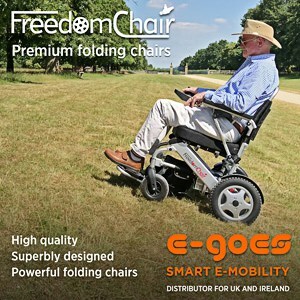 Describing it as the perfect travel companion, the company highlights that it is easy to erect or fold in seconds, with no tools needed, and can be folded and placed in the boot/trunk of a vehicle by one person, or can be taken in the hold of an aircraft. Additionally, a simple hook on an optional footplate also converts the versatile hoist into a stand aid for immediate use – ideal for users who have good and bad days where they may use the stand aid in the mornings but may need the hoist in the evenings.